A large number of villages and small towns in India, still live in darkness with no electricity lines to these remote areas. Without power life seems to be at a standstill in cities. There are numerous pressing issues that arise due to absence of electricity like absence of fans, water etc. Hundreds of millions of poor have access to a mobile phone in India today. But no electricity makes charging these mobile phones a huge problem. In places like these in India, solar powered products come as a boon. Not only are they cheap, but also green! There have been many instances where accidents are caused due to the hazardous use of kerosene lamps in the past. Though Solar energy has a huge potential to grow in India, there are many corporate houses and even small and medium sized entrepreneurships that are working diligently towards a social cause, for the upliftment of the state of power in these remote locations in India. They have decided to make energy available cheaply in a decentralised way to reach these small towns and villages. Read the Advantages of using solar lights over kerosene lamps in India. 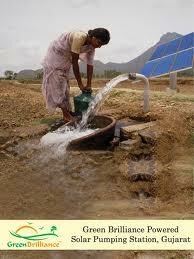 1) SELCO Solar Pvt Ltd. – This Bangalore based social enterprise was established in 1995. SELCO with its hundreds of employees and 45 service centers across India, has distributed more than 2 million solar home lighting systems since its inception. Financial aid is provided to the people through grameena banks, cooperative societies, commercial banks and micro-finance institutions. 2) D.Light – Has set a target to “empower the lives” of 50 million people by 2015 and 100 million people by 2020. D.Light manufactures and distributes solar lighting and power solutions in 62 developing countries without proper access to reliable power. Founded in 2004, the company now has 12,000 retail outlets, 10 field offices and 5 regional hubs. D.Light Design is one of the most successful solar lamp companies in India and has sold solar lamps in like S250 which also have a mobile charger. The company has now come out with an affordable solar lamp priced at Rs 399 or $9 which will help millions more access the benefits of solar energy. 3) Simpa Networks – Aims to make affordable sustainable energy choices for the billions of people in the Base of the Pyramid, lacking access to electricity. This company will be found in poor grid areas, where there is less than 12 hours of daily electricity supply. They use a unique Pay-as-you-go pricing model for customers. The customers pay small down payment for a solar system and then pre-pay for the energy service, topping up their systems through a mobile phone. 4) Orb Energy – Has branches mostly in small market towns to serve the remote villages. It follows direct sales techniques to better reach out to the customers. The company provides various solar products and solutions, like solar panels, solar lights, solar inverters and solar water heating systems, in conjunction with banks who provide loans to its customers at cheap rates. The company opened its own manufacturing unit in Bangalore India in 2015, has 150 branches in 8 states of India and plans to expand to 500 branches in India over the next three years. 5) Veddis Solar – Was started by Tarun Singh in June 2010. The company aims for the betterment of villages in India, without access to reliable power. Its flagship product called ‘Bijuria’ is a household lighting project in which a micro grid was installed. Today it supplies power to the households throughout the night for seven hours at subsidized rates and is expected do so for the next 25 years. Veddis Solar will use solar water pump panels not only for irrigation but also to generate energy for other farm chores. Jal Urja (for farmers), Nirmal jal (rural drinking water) and Swach jal (RO drinking water) are some of the water pumping solutions provided by Veddis. Tata Solar Power – Backed by the TATA group, one of the oldest industrial houses in India, Tata Solar is engaged in manufacturing and EPC services. Tata Solar has presence in industrial, commercial, both on-grid and off-grid solar projects and residential segments. Tata Solar is also the best solar lighting provider in India, given the brand name and in-house manufacturing of solar components. The company initiated a solar program called Arunodaya to create awareness about renewable energy by interacting with schools, colleges, NGOs and other institutions. Su-Kam – Other than the various CSR activities of the largest inverter manufacturer in India, Su-Kam has provided electricity to the homes in Dhauj a village in Haryana India, through the proper usage of solar lights and storage systems. I receive your newsletters. i wanted to ask that you add e-waste and recycling/recovery as a category under green tech since there is a lot that needs to be done in this sector and the support of blogs such as yours can really be an encouragement. Also, there is just not enough info and you can make a difference. Thanks for reading my blog and for you valuable comment. I will agree with you 100% that there is not so much information on e-waste still available. Though I want to increase awareness in this category, I need the support from enthusiasts like you in the industry. I would pursuade you to contribute your thoughts/ any news/ any technology under this topic in my forum, to spread the word. Once again thank you, I look forward to your active participation!